When brothers Hank and John Green started their YouTube channel in 2007, then called Brotherhood 2.0, they had no idea what it would grow into. Initially, the channel was an experiment to see if two brothers could communicate with each other for a year solely through YouTube videos – interesting concept and totally unique, never been done before. As of 2013, the channel, now called Vlogbrothers, has reached 1 million YouTube subscribers and the Green brothers now run a huge corporation with DFTBA Records, John’s books, and the yearly YouTube convention VidCon, raising large amounts of money in the Green name every year. The Green brothers have turned a hobby, passion, creativity and a family connection into a business that keeps growing and that never forgets the fans and their fans’ interests. The brothers have an honest a blunt approach when it comes to business, with no glamorizing, just a whole lot of energy; and that energy is contagious (which is evident by the amount of YouTube subscribers the Vlogbrothers have). The Vlogbrothers YouTube fame, and first inspiration to turn their hobby into a business, started when younger brother Hank wrote a song in July of 2007 about the upcoming final Harry Potter book called “Accio Deathly Hallows”. The video made the front page of YouTube and subscribers poured in. Hank had been writing songs for what the brothers called “Song Wednesday” while they were still Brotherhood 2.0 and the popularity of “Accio Deathly Hallows” inspired Hank to create a full album of songs about his interests. However, Hank knew that he couldn’t send an album full of songs about Harry Potter, quarks, and anglerfish to a traditional record label. He also knew that there were many fellow YouTubers who wanted to publish records of their own. This led to Hank starting DFTBA records, named so for their slogan “Don’t Forget to Be Awesome”, to independently produce albums and send them out to the public. Along with Hank’s first album, So Jokes, DFTBA records has helped release music and merchandise by YouTube stars Rhett and Link, Alex Day, and Charlie McDonnell. The company continues to produce strong revenue for the Green brothers as well as making sure that the artists on the label are getting equal shares without contractual obligations. These guys bleed integrity; it’s awesome to see! 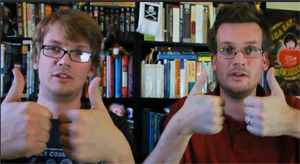 John Green has also made a huge business out of his Vlogbrothers fame. When Brotherhood 2.0 began, John was working on a book called Looking for Alaska. The book released March 2005 to rave reviews, winning the Michael L. Printz Award in 2006 and fans rushed out to buy the novel. John’s books have only grown in popularity since then. His following books, An Abundance of Katherines and Paper Towns, did amazingly well thanks to pushing and mentions on the channel while John was writing both. Paper Towns even debuted 5th on the New York Times bestseller list for children’s books and won John an Edgar Award in 2009. The Vlogbrothers community, now called Nerdfighters, was at an all-time high when John released his latest book The Fault in Our Stars, which was named Time Magazine’s fiction book of the year for 2012 and is currently in production to become a blockbuster film. John’s books are good on their own merits, but he often notes that, without the Nerdfighters backing him, he would never have gotten as successful as he currently is. When not running a successful online business and writing award winning novels, the Vlogbrothers are also bringing the YouTube community together. Hank and John saw a need for content creators to meet, share ideas, and interact with their demographic. To make this possible, they started the yearly convention VidCon. VidCon is the only YouTube and online video content oriented convention that is also accessible to fans. In 2012, the guests of VidCon packed the Anaheim Convention Center with over 7,000 attendees – an even larger number is expected for their 2013 convention. At the convention, creators get to meet ‘high-up’ business executives who educate them on the economics of video; and fans get to meet their favorite content creators. The biggest faces of YouTube, from Philip Defranco to JennaMarbles, meet and learn over a weekend that the Green brothers host. John and Hank Green are the prime examples of making business out of pleasure. The Vlogbrothers have taken an experiment in communication and turned it into a business that spans every corner of the YouTube content market. It’s hard to even touch on the commodity that YouTube has become without mention of either John or Hank. They saw an opportunity to better themselves and the community they were building and ran with it. From their own video channel, their educational YouTube programs, Sci-Show and Crash Course, the modern Pride and Prejudice vlog show to the Lizzie Bennet Diaries that the Green brothers produce, this enterprise is growing. The brothers are a brand that is to be revered for their ingenuity and willingness to put out their passionate ideas. In the content publication business, which spans from blogging to print, vlogging, editorial writing, whatever, you must be passionate about the subject matter you are covering! It truly can’t be about the money because you will not last if that’s all it’s about! Anyone starting a media property (which is what the Vlogbrothers did in 2007) must come to terms with the fact that they won’t earn anything until they earn the respect of their readers or viewers. To earn that respect it takes passion, honesty and consistency – and you need all three. No matter how honest and passionate you are, if you aren’t consistently producing content, your audience will wander away. There’s a reason why the Sunday paper became so popular 50 years ago. It became a routine to read. There is nothing easy about establishing a following online and your readers can see right through any act. Unless you love what you write about, you won’t be able to survive the long nights building your content into the simple masterpieces they need to be. They made their pleasure their business. They saw what they were doing as something that people would enjoy and made it available for purchase. They recognized that YouTube was a growing community and saw the website as something that could be an enterprise. John’s books were successful not only because of his mentions on the channel, but because of his honest enthusiasm when talking about them. Both brothers show a charisma about their projects that make you want to invest in what they are doing. They’re not afraid to try new things. The brothers are now trying to bring education online with their educational programming – something they aren’t sure will work, but nevertheless are extremely passioante about. We can all learn a lot from these self proclaimed nerds. As John and Hank would say, “Don’t forget to be awesome”.